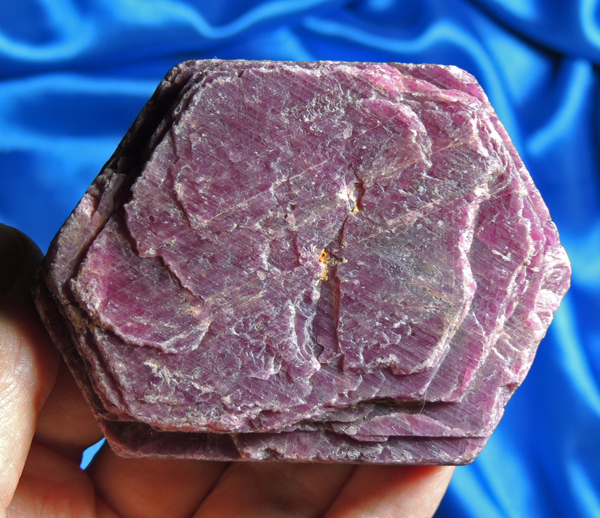 This awesome rubyfrom India is 11.1 oz and 3" by 2.4" by 0.9" … and a gorgeous color whose red leans toward purple! Indian ruby is some of the most highly prized in the world and this crystal is exceptional … doubly terminated with loads of layering and record keepers! There are cross-hatched glyphs all over and sides are covered with teeny keys that may have once housed garnets. He has huge energy and a wondrous hand-feel and is perfect for your special altar spaces! You will positively be in love! Rubies are awesome as personal power stones and make wonderful pocket or medicine pouch crystals for daily carrying – just to remind you of that true source of power – your Self! It should be noted that you will need a large pouch for this one! They are also wonderful used in grids or as activators for other crystals. They function similar to a dial and are literally able to adjust the energy level in a grid or within another crystal, making them perfect for altars as well. The vibrations of this Spirit are exceptional and you will be beyond enchanted!